HydroPool spas live on the cutting edge of pool technology, using an ingenious cleaning system that takes all the headaches out of owning your own oasis. Integrating the power of water currents, water purification, and ergonomic design, HydroPool Spas truly are the complete package. 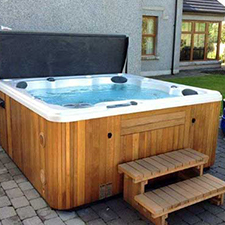 When you choose to shop with the Hot Tub Outlet, we’ll go the extra mile to make sure you get the perfect HydroPool for your needs and budget. Our customer service is second to none, and we’re excited to work with you! From massage to training to simple soaking at the end of a long day, your HydroPool Spa will surpass your expectations, especially when you buy with our experienced team. 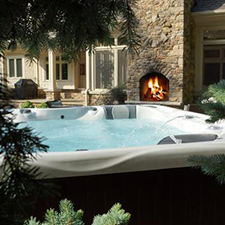 Our abiding passion for improving people’s lives with world-class hot tubs and spas uniquely equips us to meet your needs. We’ve been in the spa business for more than 25 years, and we’ve seen fads come and go. We’ve learned what lasts and what doesn’t — and we’re thrilled about HydroPool Spas. They not only offer everything you need in a spa, they also clean themselves, save you money on chemicals, and make maintenance easier than it’s been — ever. They are a no-brainer! Whether you have preliminary questions or you’re ready to buy, contact us or visit us in Westland to chat in-person. We’re ready to answer your questions, give demonstrations, and work with you to find the best way to move forward. Take the first step today!